It has been well documented that free agent salaries have fallen since last offseason. Right now, the average dollar amount per marginal win that MLB teams are paying is $3.56M for hitters and $3.42M for pitchers, according to the Free Agent Tracker over at Sean Smith’s www.baseballprojection.com. Has this dollar value persisted throughout the entire signing period, or have we seen a decline since free agents began signing in November? 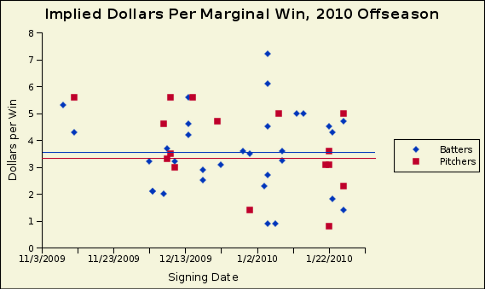 This graph will show us our answer (does not include Orlando Hudson’s contract). The blue and red lines signify the means for batters and pitchers respectively. There isn’t any discernible pattern or flow to this market. As we proceed into March, it’s possible that remaining talented players such as Johnny Damon and Felipe Lopez may have to accept below market deals in order to find roles on teams. However, this won’t have a large impact on the market as a whole – based on CHONE projections and the signings that we’ve seen this winter, the market for wins has indeed fallen below $4.0M, and seems to be settling around $3.5M, regardless of when the contract was signed. As we push towards the end of the recession, we should see an upswing in this amount. If free agent salaries don’t rise towards or above $4.0M next season, it means that baseball (and likely America as a whole) is still feeling the effects of recession. Some indicators do suggest that the recession is headed towards an end (or over already), and so a surge in the winter of 2011 is likely. We hoped you liked reading Down Goes the Price on Wins by Jack Moore! I like how fangraphs always pushed the boundaries. Who needs headlines? What is the marginal value of a head vs its marginal cost? I kid, I kid. I like the work. ^What is the marginal value of editing vs rushing to be the first poster? Probably about 10 thumbs down for failed snarkiness. Headlines probably have more marginal value than content………. David Appelman moonlights at The Onion.